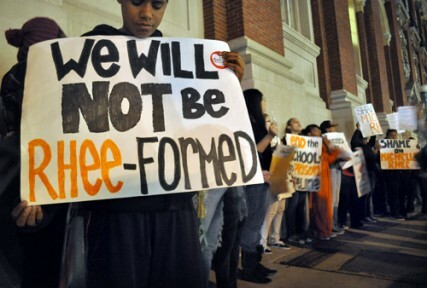 Michelle Rhee-form protest in Seattle. Join us. There will be a protest at 6:00 PM on February 19th in front of Town Hall where Michelle Rhee will be talking about her latest fundraising effort, her book. Join us. We’ll have signs…and tape. You can join us on the Facebook page Michelle Rhee picket and print informational flyers for the event from this web page. Print a few and bring them with you if you can. On a personal note, I come from a long line of proud African-American female teachers. At one time, teaching was the only profession that African-American women could participate in so that was the chosen profession of my grandmother and my aunts. 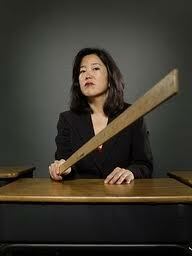 The first time that I heard about Ms. Rhee was when she had fired teachers en masse in DC for abusing children. I found this shocking but once I looked into it, I found that she had lied. This woman had maligned the good name and reputation of many proud, many times female and mostly African-American teachers. How dare this woman who knows nothing about educating children and has no respect for children who she continually refers to as “kids”, and has no respect for the culture of the people who she pretends to be championing, tell us what she thinks that we need to know about educating our own children. I find her personally to be offensive and when I hear her speak, she sounds ignorant. Washington Post reporter Bill Torque takes a close look at the DCPS budget and notes there’s a serious difference between Michelle Rhee’s budget and that of her successor, Kaya Henderson. One of the more striking line items on the operating side is for private grant funds. They averaged about $21 million between 2010 and 2012, as the Broad, Arnold, Walton and Robertson foundations supported the labor contract negotiated by former D.C. schools chancellor Michelle Rhee, one that eliminated seniority preferences and established big performance bonuses under IMPACT. As for the money aspects, she noted that Washington D.C. schools, where she was chancellor, did get grants and outside funding to support a move to a performance-pay salary system. Rhee said “significant interest” remains in the national funding community to invest in such efforts, which could be paired with local and state decisions on how to change spending to cover the costs long-term. I guess that Eli Broad, Wal-Mart and Rhee have moved onto something else and have left DC holding the bag on that merit pay scheme they pushed through. Florida legislators have done the same thing. Incoming house speaker, Will Weatherford wrote in a December 2009 Gainesville Sun op-ed piece that Race to the Top funds would give teachers “real financial rewards for excellence.” It didn’t. Jeb Bush admitted in September 2011 that the legislature wasn’t funding merit pay. Broad and the Walton’s did move on, to fund StudentsFirst. Rhee is now under investigation for cheating scandals that occurred during her watch but that doesn’t keep her from tooting her own horn in pursuit of devaluing the entire profession of teaching. 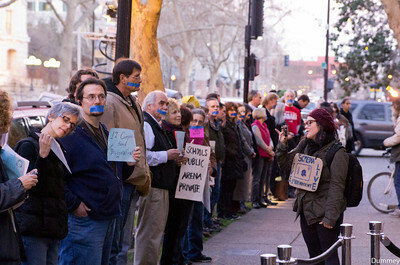 A protest in Sacramento during an appearance of Rhee. And of course, who could forget the time when she fondly recalled taping the mouths of her students when she didn’t know how to manage her class as a first year Teach for America, Inc. (TFA, Inc.) recruit? 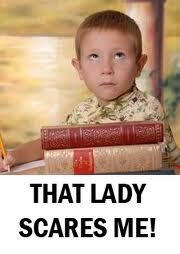 Or when she started to mimic the way one of her African-American students spoke during that same narrative? It was enough to make me somewhere between sick and incensed listening to her joke about this with a group of first year TFA, Inc. teachers. The Magical Me Ms. Rhee is also on the Broad Foundation’s Board of Directors along with Steve Barth, Founder and CEO of KIPP charter schools, and his wife, Wendy Kopp, Founder and CEO of TFA, Inc. It’s a very cozy situation with this ed reform crowd. Going back a bit further, Rhee spent three years teaching as a TFA, Inc. recruit. and then went on to found an organization called The New Teacher Project, a TFA, Inc. wannabe based on the same business model, before being selected to lead the charge of education reform in DC schools as Chancellor by former Mayor Fenty. Rhee had no previous experience as a principal or a superintendent running a school district but now she was in charge of an entire city of students and teachers with the backing of Broad and the Walton’s with mayoral control of the school system and no democratic checks and balances in terms of a fully functioning school board. What I find amusing about Rhee’s history in education is the part that she made up. See Michelle Rhee caught lying like a rug on her resume. As usual with this group, I searched for a curriculum vitae and found none for Ms. Rhee. Now she is on a well-funded crusade, taking her dog and pony show far and wide and meeting with resistance all along the way. For more on Michelle Rhee, I would suggest reading an article by Diane Ravitch titled Shame on Michelle Rhee, a New York Times article titled Amid a Federal Education Inquiry, an Unsettling Sight, a post by Diane Ravitch titled I don’t understand Michelle Rhee and a post on Seattle Education titled Michelle Rhee’s Framing of the Debate on Education written by Joanna A. Bujes, a Oakland public school parent and supporter of public education who herself is an educator. In addition to the above referenced articles, there is information on Rhee’s relationship with the right-wing element and her support of school vouchers. 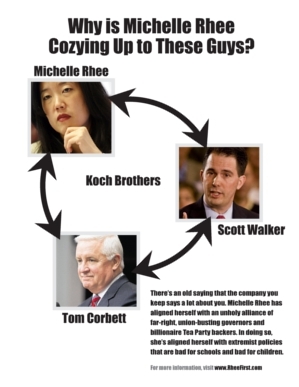 See Right-Wing Campaign to Privatize Public Ed Takes Hold in Pennsylvania and Michelle Rhee Steps Out With Scott Walker To Accept DeVos Accolades. There is also a post on the Parents Across America website, Parents flunk Michelle Rhee’s StudentsFirst. You forgot the part where she laughed when talking about the students’ lips bleeding after they pulled off their tape (“I forgot to tell them to lick heir lips first,” she said/lied to a large group of teachers.) Then she told the story of how she took several small students for an outing, but had “forgotten” to get their addresses and drove around looking for their homes, even getting out with one boy to walk around until someone recognized him. This audio was linked to a story in the Washington Post. She sounds like she is lying through her teeth, because no one can be that stupid not to know in advance where these students lived. She is a sociopath. Reblogged this on Scrap the MAP!. 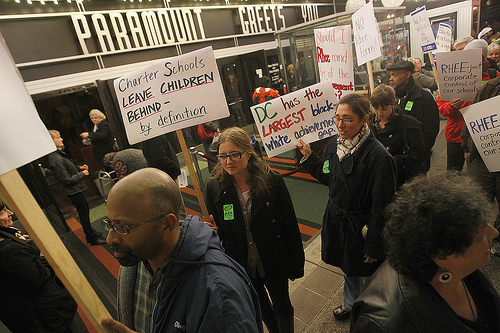 I’ve spent years refuting the Rhee myth in DC and am delighted to see that you and others have taken up the cause. This is a wonderful blog! You do a great job, Dora.